Given the revenue magnitude, airport management is keenly aware that customers’ parking experiences should never be taken for granted. Especially since the rise of Uber and Lyft, DFW knows it has to make parking at the airport an attractive option. Teams worked for approximately one year to ready the online prepaid parking system—six months preparation for the soft launch in September 2017 and six months of beta testing before the public launch in April 2018. To date, the system has far exceeded preliminary projections. The airport forecasted 30,000 transactions and $1.8 million revenue during fiscal year 2018. Actual usage totaled 67,800 transactions and $3.6 million—about double what was expected. Sweetening the results, more than 50% of users were new customers who had not parked at DFW the prior year. Moreover, follow-up surveys indicate that fully 93% of customers who used the online system were satisfied with the service and would recommend it to others. The system charges variable rates based on length of stay, convenience of parking location, time of booking and supply/demand. Drive-up fees for DFW’s three parking options—remote, express and terminal—range from $10 to $24 per day. By contrast, reservations made and prepaid online can cost up to 75% less. Customers book prepaid parking online by entering their flight information, payment method and promotional codes, when applicable. The system automatically displays all available parking options and potential savings for each choice. Although specific parking slots are not assigned, users are guaranteed a spot will be available. Parking time can be amended up to one hour before scheduled arrival; time extended at either end is charged at the applicable rate. Customers can receive a full refund if parking is cancelled 12 hours before their scheduled arrival time. 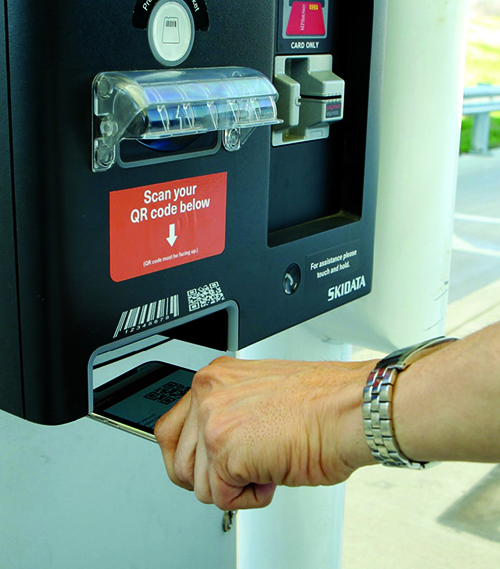 The airport hired ADVAM to manage integration of the parking system. In effect, the company linked together four separate information technology systems: the booking control system and PSB Webbank (ADVAM), parking revenue control system (SKIDATA) and the airport’s mobile app (M2Mobi). According to ADVAM Key Account Manager Chris Morris, DFW wanted to provide users with a high-quality online experience that required a minimal amount of keystrokes. Users are able to store their payment details to allow for one-touch payment at checkout. “This reduces the number of cancellations that may occur at checkout when people have to go search for their wallet,” explains Morris. DFW also wanted customers accustomed to scheduling and paying for parking on the airport website to have the same experience using its mobile app. To accomplish this, ADVAM opened its application program interface to make booking flow recognizable on the app and allow all features available on DFW’s website to be available on the app, including one-click payment at checkout. 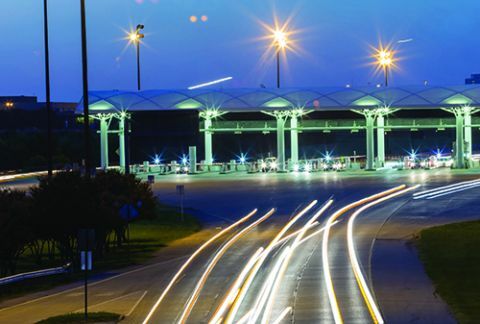 Customers with prepaid reservations use either a cellphone Quick Response code or North Texas Tollway Authority TollTag to enter parking facilities. Dovetailing with the TollTag system was important to the airport, notes Morris. ADVAM worked with the Toll Authority and SKIDATA to enable full integration, whereby a user’s license plate number is checked against the TollTag database to verify the validity of the tag on purchase. The information is then transmitted to SKIDATA; and after the TollTag is validated upon arrival, entry is allowed to the parking facility. “The entire experience is seamless for the customer,” Morris reports. In light of the complexity required to integrate three separate IT platforms, Ackerman reports that the airport is very pleased with how smoothly the system is running. “Although getting there was not without a few hiccups,” he adds. Case in point: The Wednesday before Thanksgiving week, the airport ran a one-day Orange Wednesday flash sale for bookings from Thanksgiving week through spring break. In preparation for increased demands on the system, the airport’s IT team added extra bandwidth. “In effect, we supersized the system,” explains Ackerman. Enhancing customers’ parking experience and maximizing associated revenue were the primary goals for developing the prepaid parking online program. Currently, the airport is averaging 4,000 prepayments per week; total revenue through December 2018 was nearly $7 million. However, the program is yielding long-term benefits for the airport as well.